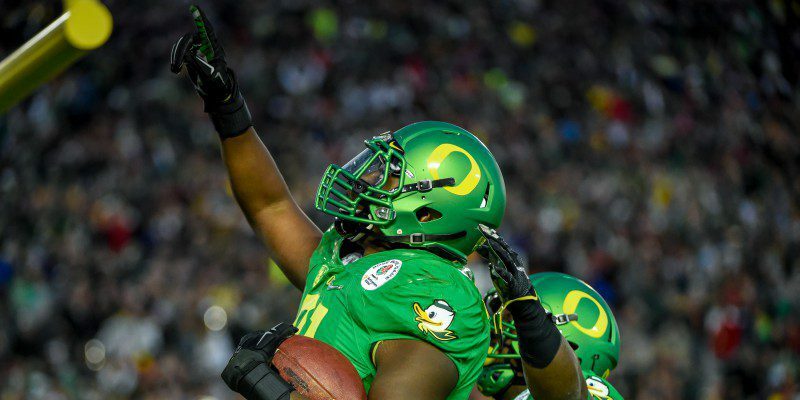 When it comes to the Oregon Ducks football season this year, the accomplishments the team and program made are unreal. For the team, for individual players, for the coaches and the university, it was more than a successful season; it was a historical one. After the 2013-’14 season ended last year, a group of writers for ESPN wrote team-by-team season reviews for all the Pac-12 football programs and graded them based on their performance that season. Kevin Gemmell wrote the one on the Oregon Ducks football program. Here is a brief discussion of what Gemmell wrote in his review for each of the following positions: offensive and defensive performance and then what they could possibly be given for a grade after ’14-’15 season. Gemmell also discussed the special teams unit and the overall team performance. It is definitely safe to say that the Ducks’ recent season and their previous season were very different in many ways, but mostly when it came to the success of the offense and defense. 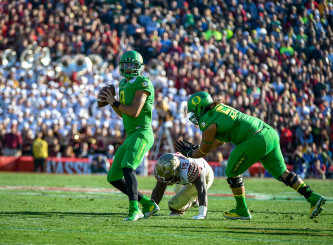 The ’13-’14 season had obstacles, such as Mariota being injured and unable to run the ball as much as he did this season. The Ducks ’14-’15 season came with different injury challenges that affected the team but also revealed some diamonds in the rough who took advantage of their field time, such as Evan Baylis in the Rose Bowl. Overall, this was an A+ season for the Ducks on the field and off the field, not to mention one that will be remembered in the history of college football for a long time!